The long-promised 5 Minute Bread recipe post. Quick and easy enough to make and bake fresh for dinner. 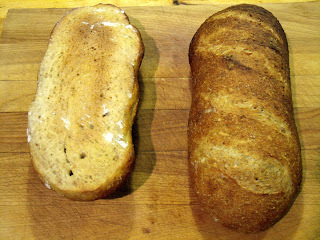 Versatile enough to become Garlic Bread, French Toast or Panini-Pressed sandwiches if it doesn't get used up. Take it to dinner parties that you want to get invited back to. How easy? Read on and see. How Cheap? I did a quick cost estimate, using GroceryGateway.com prices (basically the most expensive you can get) and it worked out to $1.85 per batch. A batch makes 4 loaves, so about 46 cents per loaf (probably less). Finally, how delicious? Make it and let me know. What's that? 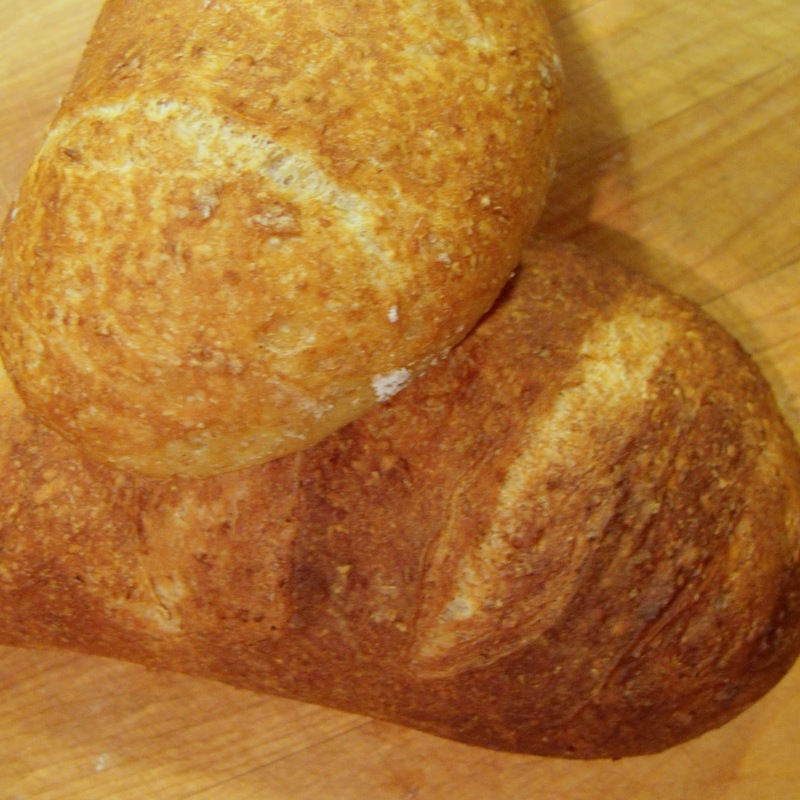 Can't speak with your mouth full of warm, buttered fresh bread? 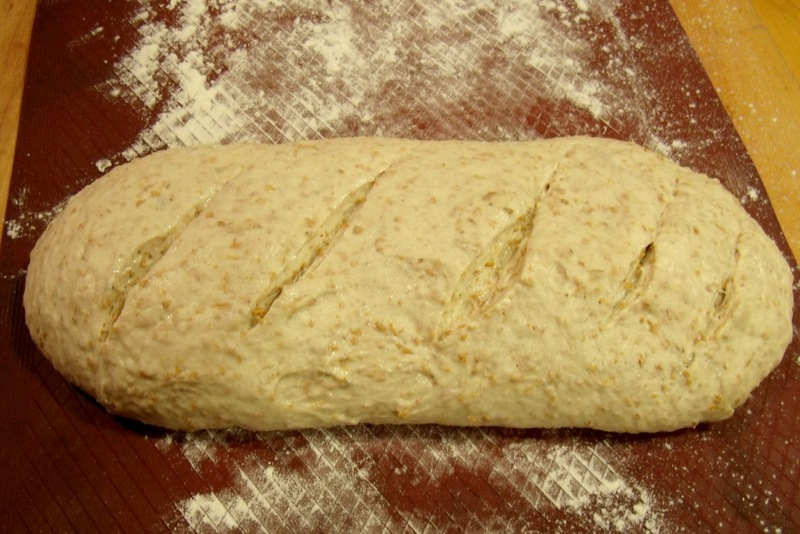 The Basic Bread recipe is pretty easy if you have done all the prep steps. Make sure it has spent at least a couple hours in the fridge prior to use. 1. 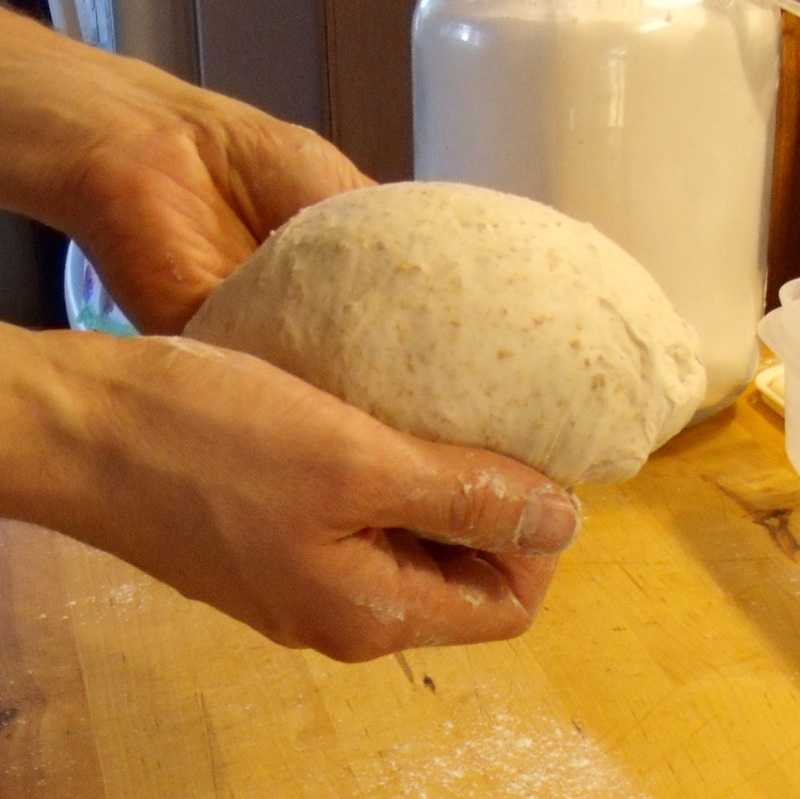 Quarter the dough with a serrated knife (if you haven't yet) and dust with flour. Scoop out a section using floured hands and form into a ball by smoothing the top and tucking underneath. Do this quickly: 10 seconds per ball is plenty. Repeat for second loaf. Place them on a piece of parchment paper or a floured silicone baking mat. 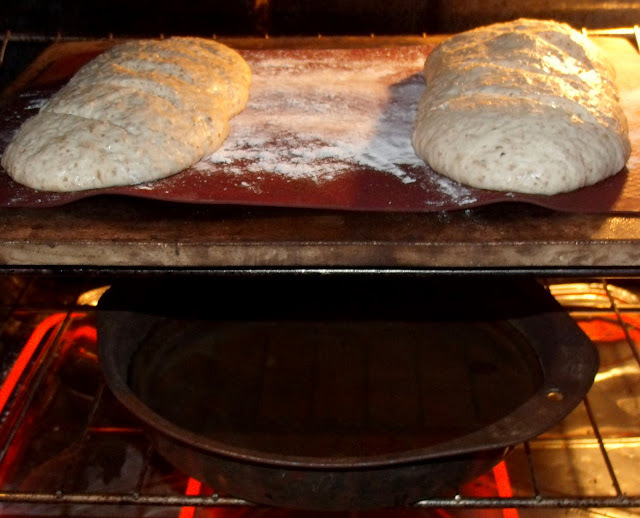 (The authors of "Artisan Bread in 5 Minutes a Day " Book say you can use a floured pizza peel and slide the bread right onto the pizza stone in the oven. I haven't been brave enough to try that yet. I prefer the paper or mat technique. I have a pizza peel, as the book recommends, but when making large loaves I use a large cutting board. I need more real estate for the dough to rise on. 4. Preheat oven to 450F (if using a silicone baking mat, check what temperature is its max). Let bread rise another 20 minutes while the oven preheats. 5. Your loaves will have risen for 40 minutes now. Use your serrated knife and score the bread. You can use cuts like I have shown, one long cut down the middle, a # sign pattern on a ball-shaped loaf; whatever makes you happy. 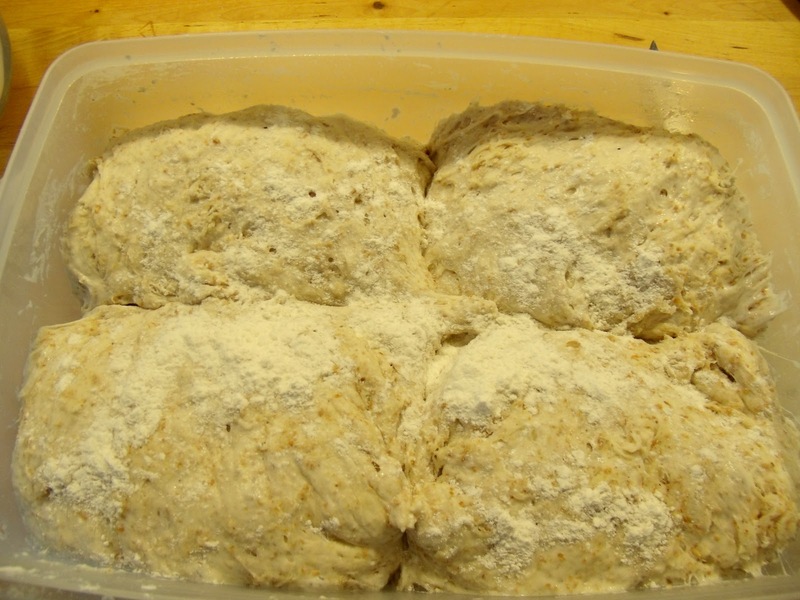 You can also dust your loaf with more flour, oats, poppy seeds, herbs and garlic, to further fancy it up. This batch I did plain, so our kids would eat it. You can omit the water entirely too - the bread comes out with a less 'crusty' crust, so if your kids are going to eat it, that might make 'em happier too. 7. 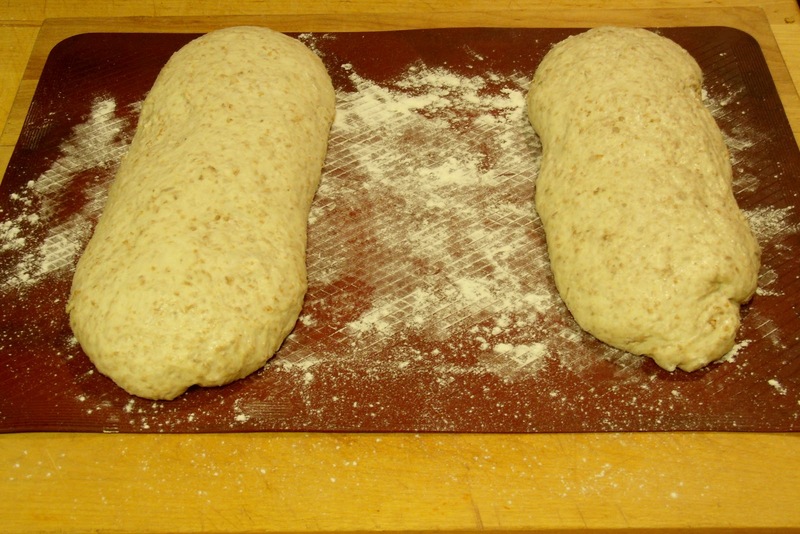 Bake 25 - 30 minutes usually produces cooked bread. 8. Remove to cool on a rack or breadboard. Allow at least 15 minutes before you slice a piece and cover it in butter/margarine, as it will cut easier. (It will be the longest 15 minutes of your life, believe me, it's hard to wait. It's that good.) Use within a week, as there are no preservatives. This recipe is one of the meals on our Meal Plan Master List. Check it out here. 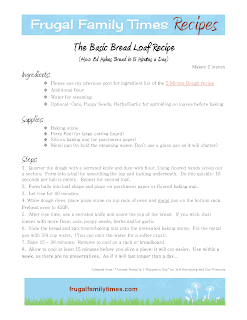 Have you tried this bread recipe? Leave a comment and let us know! By stocking up on sales and buying in bulk, I would estimate our cost per loaf as closer to $.20 to $.25. Thanks for commenting and we're glad to hear the dough worked for you. 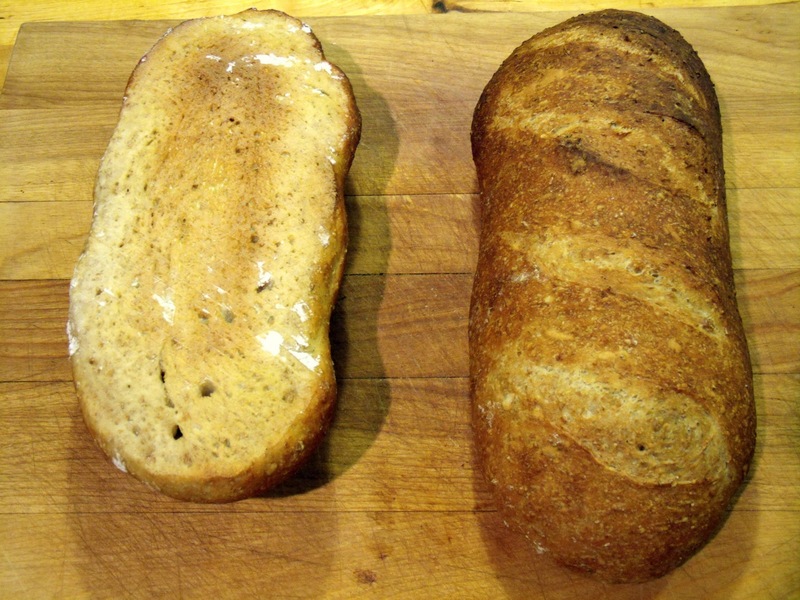 We're currently tinkering with some more variations/uses for the 5 minute bread - it is very versatile. 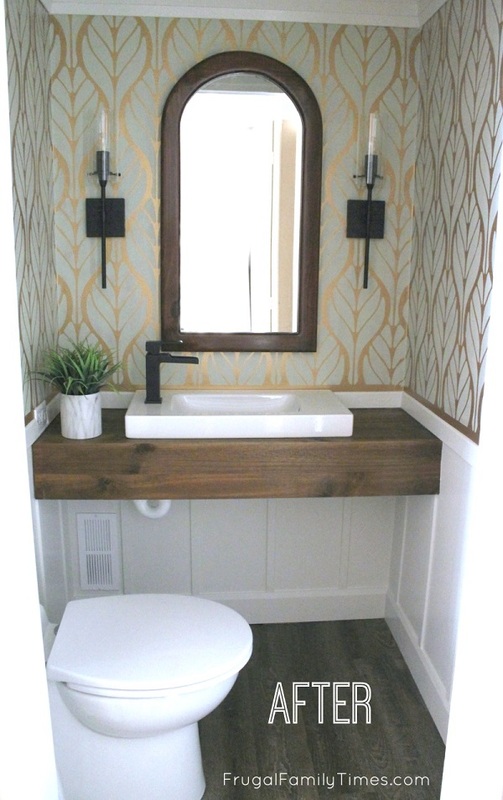 Please post with any more uses you have tried out - we love new ideas. Last night's was olive, rosemary and parmesan. Rather than trying to knead the ingredients in, I just picked up a piece of sticky dough from the fridge and flattened a little in my hands, popped the ingredients in and folded the edges to the middle and then in half again (or a slightly less organised version of cramming). Once it was shaped and had risen, the ingredients had spread very nicely. Rapt!